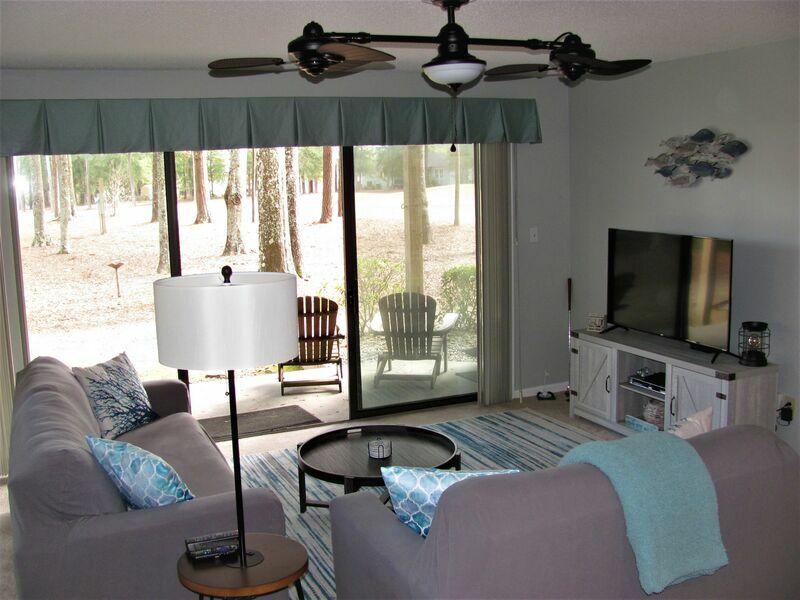 Ground level non-smoking fairway villa overlooking Oyster Bay Golf Links Pet-Friendly - Small dogs ONLY (Non-refundable pet fee will apply) - No Phone - Wireless Internet - Two bedrooms/two full baths on ground level. 2 Queen / 2 Double beds, cable television (3 TVs), DVD, central heat & air, washer/dryer. The villa features an open floor plan with adjoining kitchen, dining and living areas. The kitchen is fully-equipped with dishwasher, microwave, coffee maker, blender, toaster, full-size refrigerator and range. There is an outdoor patio accessible from living room and master bedroom areas with a view of the green. The second bedroom has a private screened porch. Community pool, hot tub, charcoal grills and tennis courts on site. Complimentary linens, towels and departure cleaning service are included.